Our range of allergy alert and medical keychain and ID tags are perfect for those with allergies and with medical conditions. 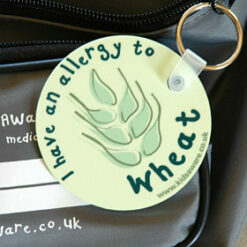 Our Allergy Alert Keyrings let others know about your allergy. 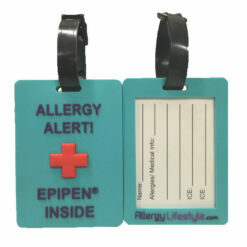 We have two different styles so you can also let them know that you are carrying an EpiPen® or other allergy medicines. Our Medical Keychain range has two styles of ID. The tags both have an ID card on the back that you can fill with your name, allergies/medical info and 2 emergency contact numbers. The front of the keycahins has either an "Allergy Alert" with an "EpiPen® Inside" notice or a "Medical Alert" with an "Emergency MEdicines Inside" notice. Hang these keychains and keyrings on your medicine bag or case to make sure others know where to get your medical info and medications in case of an emergency.